The sprayings will start at 9 p.m. Monday evening. 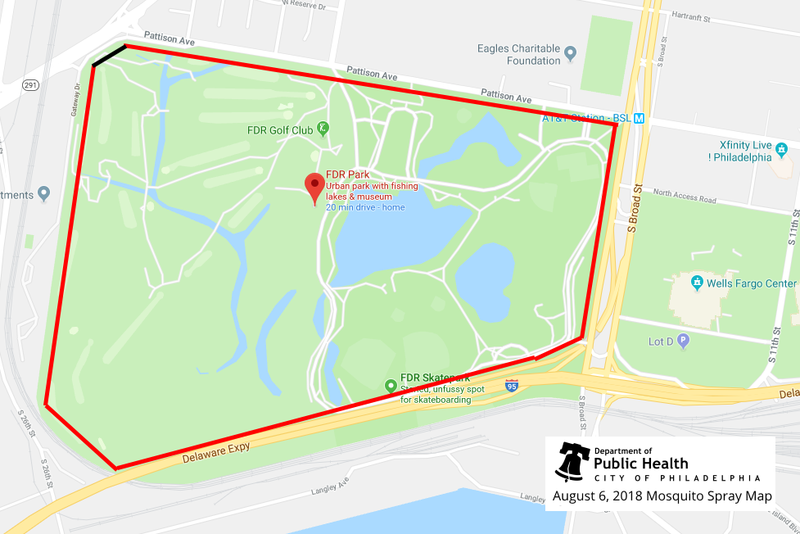 Weather permitting, the Philadelphia Department of Public Health’s Vector Control staff is planning to apply treatments to control adult mosquitoes after 9 p.m. Monday evening, Aug. 6, in FDR Park in South Philadelphia. Samples taken by Vector Control staff in the targeted area have shown adult mosquito populations that can potentially carry the West Nile virus. The treatments will be administered via a truck-mounted machine spraying fine aerosol droplets. The mist stays aloft and kills mosquitoes on contact. The truck-mounted operation will spray BioMist 3+15, which is a synthetic pyrethroid. This product has no residual effects, and evaporates quickly into the atmosphere. Certain mosquitoes species carry West Nile virus, which, when transmitted to people, can cause West Nile encephalitis, and infection that can result in an inflammation of the brain. Individuals are urged to take personal protection precautions to avoid being bitten by mosquitoes. Many mosquitoes are most active at dusk and dawn. Be sure to use insect repellent with an EPA registered active ingredient and wear long sleeves and pants at these times or consider staying indoors during these hours. Drain or dispose of discarded tires where mosquitoes breed. Have clogged roof gutters cleaned. Roof gutters can produce millions of mosquitoes each season. Don’t let water stagnate in birdbaths. Clean and chlorinate swimming pools. A swimming pool left untended by a family on vacation for a month can produce enough mosquitoes to result in a neighborhood-wide problem. Wear long-sleeved shirts, long pants and socks when outdoors, particularly when mosquitoes are most active at dawn and dusk, or in areas known to have large numbers of mosquitoes. Use insect repellents according to the manufacturer’s instructions. An effective repellent will contain DEET, picaridin or oil of lemon eucalyptus. For more information about West Nile virus and the state’s surveillance and control program, go to www.westnile.state.pa.us. For questions of the West Nile Virus program in Philadelphia, call (215) 685–9000.